The Freya Miranda underwired plunge bikini top from Freya Swim has a deep plunging neckline offering a flattering look. 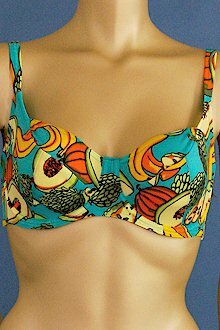 Underwired for support, in a wonderful tropical fruit print, looks great with eith classic or narrow bikini pants. The Freya Miranda Beach Skirt is a shear pull on style skirt which is longer than most styles giving a more sophisticated look. Use to accessorise items from the freya Miranda range.